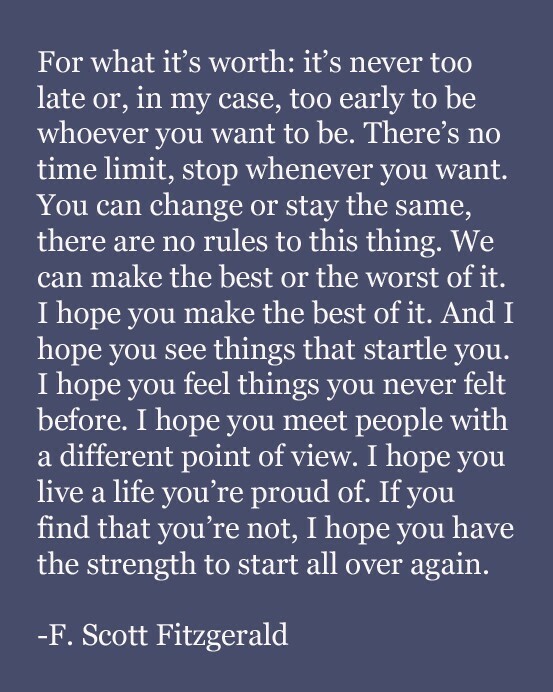 F. Scott Fitzgerald On Living Your Dream Life! I grew up reading these crazy books my dad had about moguls in the 80’s who built themselves up from nothing, lost it all, bounced back from total ruin, and sometimes did so multiple times, never aftraid to start all over again. I guess that is to say that there’s nothing wrong with an occasional life reboot! And in our cuture obsessed with youth, its important to hear and know that you are never too old to do anything! Enjoy this one! If you are looking to boost your spirits and make your intention much stronger, let your home help reflect your personal best and help those dreams come to life. Your Guide To DIY Feng Shui is here for you! Rugs That Make The Room! I like that, because it means you can start your life over at anytime, no matter what has happened in the past, see every day as a new beginning. Previous post: Jenny Holzer Truisms Will Rock Your World!